Heading to Skydive Monroe for a tandem skydive puts you in close proximity to a city bustling with things to do; we are talking about Atlanta! The city of Atlanta, Georgia is booming, so much so it has been nicknamed Hot’lanta. With so many things to see and do, it is not hard to see why skydiving near Atlanta is the best. Come close to Atlanta to skydive and stay for the day. Here are five attractions that make skydiving near Atlanta worth the trip. Home to more than a thousand species of marine life and more than a hundred thousand animals, the Georgia Aquarium in Atlanta, Georgia is a perfect destination for the whole family. Why limit yourself to one section of the biosphere? Skydive Monroe’s proximity to Atlanta allows you to soak in the atmospheric sights of the Georgia skyline and experience the creatures of the sea all in one day! Some people call it pop, soda, or cola–no matter what you call it Coca-Cola is downright indigenous to the Big Peach! A staple to the Atlanta scene, the World of CocaCola is a nice cool place to explore. Visit the museum after your jump with Skydive Monroe, sip sodas from around the globe, and think about what an awesome choice you made skydiving so near to Atlanta. With more than 15,000 works in its permanent collection, the High Museum of Art is the leading art museum in the Southeast. Take in the excitement of a skydive and follow it up with a quiet stroll through winding halls of European paintings, nineteenth and twentieth century American and decorative art, and collections of modern and contemporary art. We suggest getting a tour to get the most out of the museum’s collection. Expand your horizons and your mind with a trip to the Fernbank Museum of Natural History. 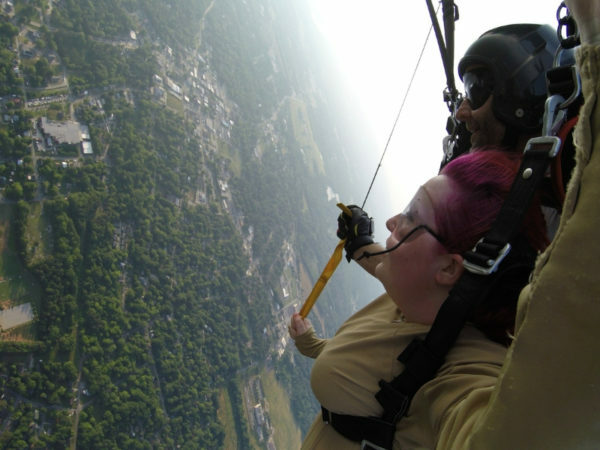 The adventure doesn’t have to stop at your tandem skydive. When you skydive near Atlanta, you’re not far from the ability to explore cultural artifacts, live animals, and hands-on scientific discoveries. After basking in the brisk air at 14,000 feet, pack a picnic and pay a visit to Sweetwater Creek State Park. Just 15 miles from Atlanta, the park has plenty of rich wooded walking and hiking trails to help bring you back down to earth. Additionally, when you skydive near Atlanta, if you plan on visiting several of these sites, we suggest purchasing the Official Atlanta CityPASS. With this pass, you can save a percentage on visiting the following attractions: Georgia Aquarium, World of CocaCola, and Fernbank Museum of Natural History. After seeing how much there is to do, it is no wonder that residents around Georgia think skydiving near Atlanta is the best! Don’t just take our word for it, come see us at Skydive Monroe and find out.